And boy does she ever let us know it. My Mom always says two-year-olds are either adorable or horrible. 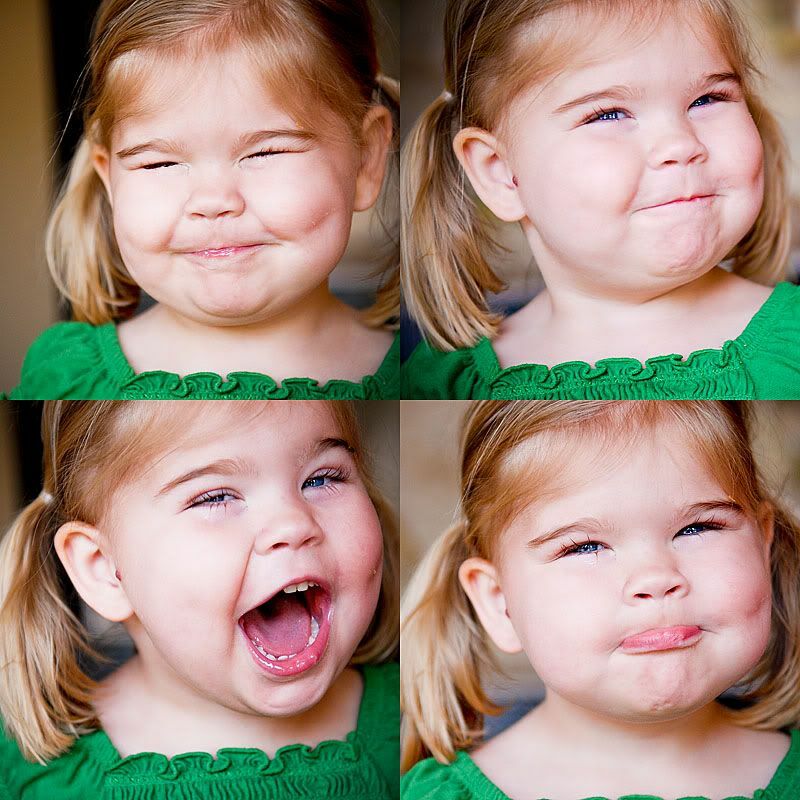 For the first half of her life as a two-year-old she was the former: adorable. We couldn't get enough of those smiles, those chubby cheeks, those soft, squishy hugs. But now she's reverting to the latter...the "horrible" part is kicking in in full force. Yep, that monster part of being two is coming out quite nicely. She won't go to nursery. She screams and kicks the whole time. She swats away at people who are trying to be nice to her with an angry grunt. When you want her to do something, she says "uh uh" except she says it with all the "soul" she can muster up so it comes out more like "uh UUUUUUah" and she says it with a great scowl smooshing her uni brow together in the middle real tight. She HAS to have her own choice of music in the car. And if I don't get it right you can bet she's not just going to sit there and twiddle her thumbs about it. No. She's got that great high-pitched scream working just to her liking. In Lu's language: "on ace er"
Yeah, you see why I spend most of my time in the car working up a sweat trying frantically to suit her music needs? Well, maybe you have to hear the scream to really get it. But let me tell you, it's bad. And I'm telling you what, I am so darn sick of the Hairspray soundtrack I could throw that CD out the window. Except that the "scream" is worse, and makes me want to throw her out he window. So I guess I better grin and bear the darn CD. What a great post!!! So true for most everyone who has a two or three year old. I like how you keep it real. What a doll she is! Recently found your blog through a friend. Hope you don't mind. This post totally hit home as my fourth is approaching his second birthday as well. And I agree... it's a good thing they are so cute or there would be many a child flung from a window!!! I had a couple that skipped the "terrible" twos and gave three a new category all their own. It's almost worse! People allow two-year-olds their high-pitched, floor kicking and pounding tantrums with a sympathetic "been there, done that" smile. When they're three, you often get the look that says: "What kind of a mother are you?!" Oh boy. She's still adorable either way. Hi Shawni - Your book that you co-wrote with you mom just arrived from Amazon yesterday - I can't wait to pour a tall glass of iced tea and sit on the porch and start reading!! I flipped through it and the photos are gorgeous!! Lucy is a DOLL!!! Happy Birthday to my sweet niece Lulu! I can't wait to come give you a big squeeze! She is such a cutie! Those eyes!! One suggestion for the car - MP3 player! I bought cheap ones for all 5 of our kids and it has worked like a charm - especially for the 2 and 4 year old! And they especially feel special having their own earphones! What a great post! I was hooked the entire read. Love You! Happy Birthday Lucy! I wish I had some words of advice, but I've only dealt with nephews...lol...and I hear they're easier to deal with then girls. at least it isn't twins! I'm going to be brave and comment.. You have no idea who I am, but I adore you and your blog. I don't even remember how I found you, but I've been a fan for a little while now! I went to HS with your sister-in-law, Annie (Elizabeth) and I'm actually married to Tyler Williams. His family lived down the street from yours ages ago. He's Noah's age. Hi Shawnie, I love this post! My 2 girls with Bardet-Biedl are exactly like your Lucy! They are sweet girls, but when they decide they want something, holy cow!! It a total melt! My older daughter, Ashley is 16, and will often let Carly (8) have her way just to stop the crying. This is really a big accomplishment for someone with BBS. Thank goodness they have very similar likes, so most times agree on what to watch or listen to! I'm Kathryn Colton's daughter-in-law. She bought your book for the whole family! 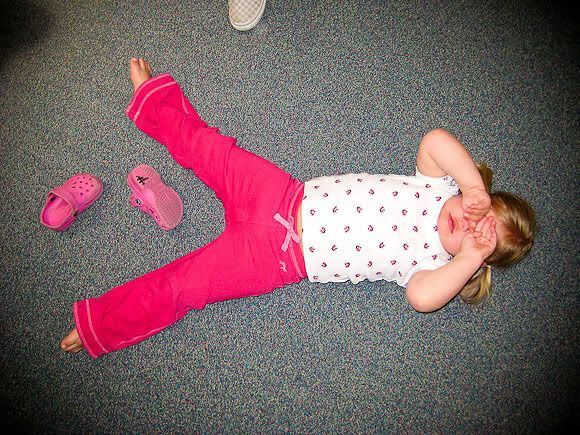 My friend Emily Falconbridge just posted the most hilarious thing about her toddler on her blog. http://embers.typepad.com/e/2009/05/the-seven-rules-of-the-toddler.html#comments. Of course toddlers are always entertaining to those who don't have them at the time. LOL She sure is the cutest thing ever though! Oh the joys of two year olds... isn't it fun?! My boys just turned three and umm the independence and stubborn fit throwing just gets worse. They are such big boys now if they don't get their way while in the car they just unbuckle themselves from the car seat. Can you say straightjacket??! Blessings to you! This too shall pass. GOSH! You just gotta love those two year old tantrums! As you know, I think two year olds are a lot harder than teenagers! BUT they're also cuter! Hang in there kiddo. That kid is adorable! Hang in there! Ellie's 21 mths. and she makes me want to either kiss her soft cheeks or cry my eyes out. She's totally a mess maker, independent, opinionated and totally grouchy (depending on if she had wheat, dairy or soy - which she tries to sneak all the time). My favorite is when she kisses my cheeks and follows it up with a bear paw swipe at my face - I always wish I clipped her nails more often. Many times I go into the laundry room by myself and get a 'moment' - a few tears, a prayer, and a motivating song in my head to go face the masses. Good luck. She is super beautiful - Lucy's eyelashes alone melt me. It can be so hard at times! lucy is so stinking cute! I didn't realize how close in age Lucy is to Lizzie. Lizzie will be 2 in July. Her eyelashes are to die for. Wow! I was reading back to when Lucy was 2 because I am having SUCH a hard time with my 2 year old right now. She is so independent and gets frustrated so easily. Do you have any advice on how to deal with that without giving in every time? Our first daughter seemed to skip the terrible 2 phase so we are at a loss. I love your blog, Shawni!